"If we picture the area some 150 years ago when Europeans first arrived in the area, the present scrub stood much as it does now with tall Red Gums (Eucalyptus camaldulensis) in the top north-east corner standing in winter in up to 1 metre of water and with a shallow lagoon stretching almost half a kilometre northward. Along the eastern boundary was a swamp, damp and boggy most of the year and developing to the south of the scrub into a large lagoon known as Blue Lagoon. The scrub was thus inaccessible for nearly 6 months of the year except from the higher north-west corner. The Aldinga Scrub owes its present existence to its boggy nature which made it unsuitable for farming, and to the foresight and determined efforts of the Willunga Council to preserve the area. By 1968 the need to preserve native flora and fauna for its own value was becoming recognised and the conservation movement was gaining momentum. The Willunga Council resolved not to allow further subdivision of the Aldinga scrub and in early 1968 refused an application for subdivision of a 10 acre (4 hectare) block for housing. This action gained active support from conservation bodies and concerned people. Over a thirteen year period, 1969-1982, about 277 hectares were purchased at a book value of well over a million dollars. The State Planning Authority assumed control of the area which was fenced and provided with signs. In November 1985 most of the vegetated area north of Norman Road was gazetted as the Aldinga Scrub Conservation Park." Since 1985, Aldinga Scrub Conservation Park has been managed by the relevant State Government authority. In 1991, an additional parcel of land on the northern boundary was purchased which brings the current area of the Park to approximately 300 hectares. In 1987, the Friends of Aldinga Scrub was formed by a group of concerned community members to protect the Scrub and to lobby on its behalf. The Friends are affiliated with Friends of Parks Incorporated. 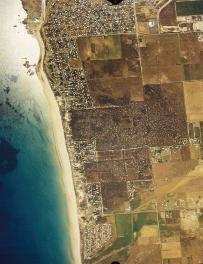 The aerial photograph above, taken in 1992, shows the Aldinga Scrub with Aldinga Beach housing to the north (top of picture) and the area popularly known as Silver Sands to the south. The Washpool and the remnants of the Blue Lagoon appear at the bottom of the photograph.